While I'm way beyond behind in my post bumping for the new year, I still plan to finish out a total of sixteen at some point. In terms of energy homeostasis, the main role of insulin in the body is as a signaling molecule in the regulation of the circulating levels of energy substrate, the two primary ones being glucose and free fatty acids. This post models this for just the fatty acids using a room temperature/thermostat feedback analogy. In the case of fatty acids, circulating levels are controlled mainly at the release point from the fat tissue. The role of insulin is to keep total amount of circulating free fatty acids at appropriate levels, and not to regulate the amount of fatty acids stored in the fat cells, and thus overall fat tissue mass. Insulin doesn't regulate fat mass. This is a bold statement. My wording is specific. Hear me out. A little over three years ago, I wrote: What Does Insulin Regulate Anyway? Yesterday a blast from that past showed up in comments on the "new" Gary Taubes YouTube video. I use the quotation marks around new, because Taubes has been delivering some version of this talk for seven years now, and the most significant changes have been to delete (and delete and delete some more) the most blatantly erroneous parts (some of which yours truly has had a hand in exposing). It's amazing, really, that he still manages to fill an hour with the pared down version. It's even more amazing that there's anyone left buying his schtick, but ... well ... I'll just leave it at that. Since circa 2010, this slide has become a part of Gary Taubes' lectures. It's all resting on the triglyceride/fatty acid cycle now (, which is a tenuous resting place at best. Ahhh how I imagine he must long for the good old days of the hypothesis, back before it was pointed out that his own references didn't support his lynchpin notion that you can't store fat without dietary carbohydrate-derived alpha glycerol phosphate (aka glycerol 3 phosphate). The slide on the right now has the First Law/Energy Balance equation superimposed on it. Which is odd, because fat cells are open systems and have no calorie receptors so that's all meaningless. Oh, and entropy. 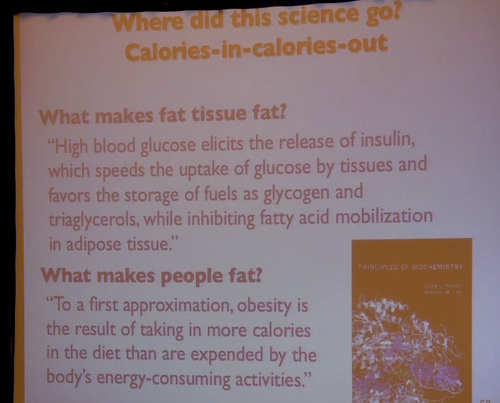 But I digress .... Taubes' point is that in order to understand how a human gets fat, we need to understand how a fat cell gets fat. The idea is to look at the balance of what puts fat into the fat cell, and what lets fat out of the fat cell. There can be no doubt that insulin acts to store fat. It stimulates esterification, it limits lipolysis. Thus insulin regulates fat accumulation. High insulin = more fat will accumulate. Right? But in that previous post, I talked about what regulating something means. Insulin is the signalling molecule in a negative feedback loop like the one shown at right. In such a scenario, a stimulus acts on a sensor which sends a signal to the controller. The controller processes the signal and sends out a signal to the effector which then does something to "effect" a reduction in the stimulus. There are other types of regulatory loops, but this is the one that is relevant to insulin. Insulin is the purple downward arrow from the controller to the effector. You didn't think I'd make it through this without one, did you? Behold the crude drawing of a room in a house in a warm environment. This room is equipped with an air conditioner (blue) that "vents" into an insulated compartment rather than the outside. Even those portable air conditioners require using a hose to vent the heat that is removed from the room by the unit. (If interested: how air conditioners work.) Since the compartment is insulated, the heat is not dissipated and the temperature will continue to rise as the air conditioner is used. There is also a locking vent in the wall to allow heat out of the compartment and back into the room if warming the room is desired. QUESTION: What is the thermostat regulating? No, that's not a trick question, and yes I'm asking seriously. ANSWER: The temperature of the room (a measure of the thermal energy it contains). QUESTION: Does the temperature in the insulated compartment matter in this regulatory scheme? ANSWER: No. The thermostat is in the room. The air conditioner removes excess heat energy from the room and stores it in the insulated compartment. 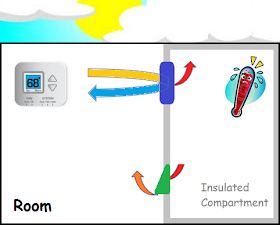 The thermostat is only able to sense and control the temperature of the room it is in, it doesn't care about the temperature in the insulated compartment. It engages the effectors -- AC on/vent closed -- to remove or add heat as needed to the room. It really doesn't care what's going on in that insulated compartment. I hope you get where I'm going here! Your pancreas, more specifically the beta cells in your pancreas contain both the sensor and controller aspects of the regulation of NEFA (non-esterified, aka free, fatty acids) levels in circulation. The setting on the NEFAstat can be influenced by glucose levels, so it's a bit more complicated, but nonetheless, its not a bad analogy at all. Indeed I think it's one of the better ones that I've made. When NEFA levels rise above the set point, the pancreas secretes insulin which is akin to the signal sent from the thermostat to the air conditioner. Only this signal is molecular in nature. Insulin stimulates the rate-limiting step in esterification of triglycerides, an enzyme that goes by DGAT (or sometimes DAGAT, diacylglycerol acyltransferase) which helps draw the NEFA into the fat cell. (Note that I didn't include lipoprotein lipase, LPL, that breaks down triglycerides from VLDL or chylomicrons, NEFA are already ready for transport into the fat cell.) 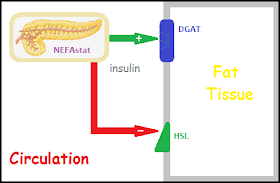 Insulin also inhibits HSL (hormone sensitive lipase) limiting release of NEFA from fat tissue. Just as Gary Taubes tells us it does. These two enzymes in the fat cells are the effectors in our feedback loops. When NEFA fall back to normal, they no longer stimulate the NEFAstat to secrete insulin. Pretty simple. QUESTION: What is the NEFAstat regulating? QUESTION: Does the NEFAstat regulate how much fatty acid is in the fat tissue? ANSWER: No. The NEFAstat senses NEFA in the blood. Insulin, as the molecular signal from the controller, regulates the circulating NEFA by acting on the fat tissue. The fat tissue is not controlling anything on its own, it is being directed to do certain things. The internal status -- in terms of how much fat is stored -- of the fat tissue is NOT being regulated here. Insulin signals fat cell functions that regulate circulating NEFA. What Does Regulate Fat Mass? 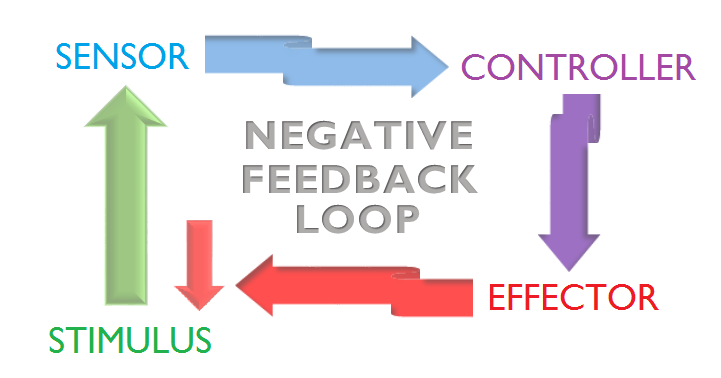 If one is interested in what regulates the fat mass of an organism, they need to go looking for the feedback loop(s). You need something to stimulate a sensor ... to elicit a response from the controller ... to activate the effector ... to do something about the stimulus. That initial something needs to come from within the fat cell itself. Hmmm ... whatever could that be? Bottom line: You cannot regulate something without a means to sense it. I'm not sure if any of you thought about my air conditioner scenario and thought, gee, why don't they do this to save energy? The reason is that air would be a very poor means of storing energy. If some of the heat could be converted into another form of energy, there might be something to that. But that compartment is going to get awfully hot pretty fast. What happens to a gas when you heat it? It wants to expand. So pressure will build up in the compartment, and there is no way to get rid of it other than to release the air which will release the heat. So what's going to happen is that the air conditioner is going to have a harder time of working (if it even works at all after a while ... see previous link) and transferring heat to the hot compartment. That vent is also going to be more difficult to keep shut and will likely leak hot air into the room. Does this sound familiar? It should. I don't know if we'll ever isolate *the* first thing that goes wrong in glucose and fat metabolism, but the fat cell is almost certainly the site where this occurs. When fat mass expands it does so by generating new cells and enlarging the ones that exist. When fat cells get too large they tend to become sick. For the same reasons as just described. It becomes more difficult to put the excess fatty acids into the cells and the cells "leak". The fat cell ceases to be a good effector -- it becomes an air conditioner that's low on coolant coupled with a leaky vent. The impaired fat cell means the metabolic feedback loop is no longer working properly. In this case, insulin fails to bring down the elevated circulating NEFA levels. This leads to both compensation and dysregulation of other pathways. Sick fat. Adiposopathy. NOT rogue fat cells stricken with lipophilia. as far as I have been able to make out, the "thing" that regulates fat mass are some transcription factors within the adipocyte. of which ppar-gamma ( isoform 2 to be specific ) seems to be the chief directing everything. It's been known for a long time that leptin is the primary regulator of fat mass; it's produced by fat cells in direct proportion to how large the fat cells get, and in turn regulates appetite and energy expenditure. This was known before Taubes wrote his book. But that would've ruined Taubes's good controversial story. "possible" exception ? Insulin seems to regulate many other "functions" and/or organs/tissues as well, including the liver by rate limiting glycogen release. I'll post a paper describing this later when I find it. Hi Albie! I'm referring to "insulin resistance" as a misnomer, not that insulin doesn't regulate many functions. However the "resistance" which is described as the organ or receptors not "seeing" the insulin, is a phenomenon that is not well supported by evidence (e.g. skeletal muscle IR as is described). The LIRKO mouse comes to mind. OK, I see. Insulin is SO much more than being about fat regulation only. This is why it is so mind boggling that NuSI exists and there are editorials in the BMJ, WSJ, and JAMA that still seek to blame carbs and insulin! So Is there such a thing as "leptin resistance"? Or you is the problem a simple matter of "No Vacancy"??? The insulin cog is between the last two steps. If our bodies didn't automatically store stuff that doesn't get burned, we'd have severe postprandial hyper*aemia (where * = glucose, TG's, NEFAs & amino acids) which would shorten our lives. Furthermore, an inability to automatically store excesses during food surpluses is evolutionarily disadvantageous as, until the advent of agriculture & food storage techniques, food availability was extremely variable. In terms of insulin, though, Nigel, wouldn't it still be part of the effector part? Even with appetite, a case could be made for insulin being a factor in short term energy acquisiiton -- e.g. low BG episodes -- but not for overall energy balance of the organism vis a vis how much fat is stored. I don't see why not. As an ex-electronics dude, I don't usually think in terms of sensors, controllers & effectors. I usually think in terms of non-inverting stages (↑input → ↑output) & inverting stages (↑input → ↓output), of which there must always be an odd number of the latter. It's amazing how these people can keep preaching the same old claptrap. I'm sure they're aware how wrong they are to an extent, but their mental gymnastics and way with words they have to keep justifying themselves is somewhat admirable. I don't know. It would be interesting if I every had the time, to look into leptin secretion vs. clearance rates. I don't think the "smelly room" analogy of Rosedale is accurate, however. Hmmmm .... Thanks for pointing out why I was reticent to just do a NEFAstat! :-) The magnitudes involved are likely an order or more in magnitude less than direct glucose stimulation, and an isolated NEFAstat would be best envisioned in the fasting state. The dramatic reduction in NEFA following a meal is evidence of the magnitude difference in the insulin responses. Is the non-suppression of NEFA messing things up? Judging from the self-reports of many long term low carbers .... (because there are no studies on this that I am aware of). I was looking for another study/paper I blogged on and this turned up. From the early days!! Whether long-chain FFA play a physiological role in regulation of insulin secretion in man remains to be established. Such an effect could promote esterification of FFA during periods of feeding and inhibit lipolysis during fasting. The latter effect could present a form of netagive feedback control limiting hormone-stimuated lipolysis. It might also help maintain the low but detectable levels of insulin during fasting tending to prevent ketoacidosis. I've got to find that other post now! Insulin Resistance makes the leptin "adipostat" NFB loop less effective, making IR people gain more weight than IS people when they overeat. Insulin is secreted in pulses. Chronic hyperinsulinaemia is caused primarily by Insulin Resistance, not carbohydrate intake (which only causes postprandial hyperinsulinaemia), though in the long-term, chronic hyperinsulinaemia can worsen IR by causing insulin receptor down-regulation. "smelly room"??? I haven't had much exposure to Rosedale. Probably a good thing. Shared this already on Twitter: more proof carbs → insulin does not inherently cause weight gain. Leptin resistance appears to be caused by brain damage. It was reported a couple of years ago by Stephan Guyenet's group that obese humans and rodents on an obesogenic diet have inflammation in the hypothalamus. This post was not really about obesity/weight loss. Yes, leptin is the hormone that regulates (or is supposed to) fat mass. The main point of this post was that insulin's job is to control the circulating energy supply, and I used just the fatty acids as an example. The part at the end about sick fat was an afterthought from the analogy. But it fits quite well with what we know about fat tissue and adipocyte function. It's pretty uncontroversial and well accepted that small "young" adipocytes are more "insulin sensitive" and effectively trap fat at appropriate times, while large "old" adipocytes are less so. In addition to losing their fat trapping abilities, these secrete inflammatory adipokines and invite macrophage infiltration of the fat tissue when they die.